Dozens of people were injured in clashes in Benghazi, a hospital in Libya’s second city said yesterday, on the eve of a nationwide ‘Day of Anger’ called by cyber-activists in a bid to emulate revolts in neighbouring Egypt and Tunisia. The director of the eastern city’s Al-Jala hospital, Abdelkarim Gubeaili, said that 38 people were treated for light injuries. The Quryna newspaper said security forces and demonstrators clashed late on Tuesday in what it branded the work of “saboteurs” among a small group of protesters. 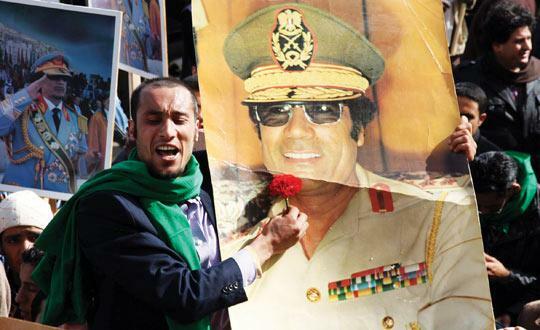 The security forces intervened to halt a confrontation between supporters of Libyan leader Muammar Gaddafi, who has been in power since 1969 making him the Arab world’s longest-serving leader, and the demonstrators, said the newspaper close to Gaddafi’s son, Seif al-Islam. It said at least 10 members of the security forces were among the injured. The veteran leader faces rare internet calls for protests nationwide today by activists buoyed by the ouster of veteran strongmen on Libya’s borders, in Egypt and Tunisia. One Facebook group urging a ‘Day of Anger’ in Libya, which had 4,400 members on Monday, had seen that number more than double to 9,600 by yesterday morning following the Benghazi unrest. Both Britain and the EU called for restraint by authorities in the North African nation whose relations with the West have improved sharply over the past decade after years of virtual pariah status. The EU urged Libya to allow “free expression”. “We also call for calm and for all violence to be avoided,” said a spokeswoman for the bloc’s foreign policy chief Catherine Ashton. In the aftermath of the Benghazi protests, activists were rounded up in the opposition stronghold yesterday, an informed source said. 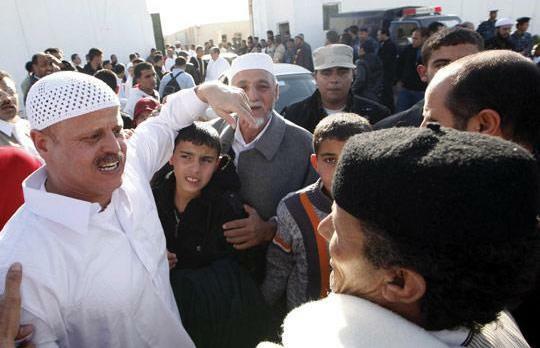 But Libya also released 110 Islamists of the Al-Qaeda-linked Libyan Islamic Fighting Group (LIFG), an AFP correspondent witnessed, bringing to 360 the number of political detainees it has freed since March last year. The protest in Benghazi started as a sit-in by families of more than 1,000 prisoners killed in a 1996 shooting in the same Tripoli prison demanding the release of their lawyer, Fethi Tarbel, Libyan newspapers said. Mr Tarbel had been detained for having “spread rumours that the prison was on fire,” according to Quryna, but was released after the demonstration. However the crowd of protesters grew and they began chanting anti-regime slogans such as “the people will end the corruption” and “the blood of the martyrs will not be in vain,” before police moved in to disperse them. The BBC quoted witnesses as saying stones were thrown at police who responded with tear gas, water cannon and rubber bullets. Marchers later hurled Molotov cocktails in a downtown square, damaging cars, blocking the road and hurling rocks, Quryna said. Soon afterwards, state TV showed footage of hundreds of Gaddafi supporters in the streets of Benghazi as well as Tripoli, Syrte and Sebha. Today’s protest has been called to commemorate the deaths of 14 protesters in an Islamist rally in Benghazi in 2006. Like protest movements elsewhere in the Middle East, dissidents have been using the Internet in a bid to rally support in a country where the media is tightly controlled by the state.